Check fraud is big business. The problem is that technology is advancing so rapidly, it has become incredibly easy to create false documents. Our blank check stock, rich in security features, makes it difficult for your checks to be copied and offers the best in anti-fraud protection. Release stock at no charge through our WiseLink online support service or call 888-813-9473 to speak to one of our customer service representatives. Same Day Delivery on stock orders if received before 12:00pm EST. Visible only under UV light; confirm a document’s authenticity because they can’t be photocopied or scanned. To protect documents that include toner-printing, these coatings bond the toner to the paper fibers. Now nearly twice as effective as other brands. Several coatings are available to meet the needs of specific applications. These measures protect against alteration by changing color when exposed to agents such as bleaches, solvents, acids or bases. Provide easily recognizable signs of attempted alteration. Disappears when rubbed or heated. Extremely small type (.010). It appears as a straight line to the naked eye but can be verified under magnification. When attempts are made to copy or scan, the type becomes a solid line. 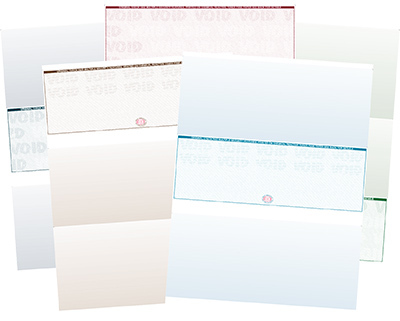 When an attempt to photocopy or scan is made, the “VOID” will show up on the copied or scanned check. This process is effective against most black and white and color copiers. I have never had any problems with production or delivery at all. They are professional and understand that promised delivery dates are essential for good customer service. Juli BazinetThe Sourcing Group LLC. I like working with the people at Wise. Everyone works to help me meet the demands of my customers. I enter most of my orders through WISELINK which I find easy to use and efficient.